Time Bomb has been a pretty cool comic. 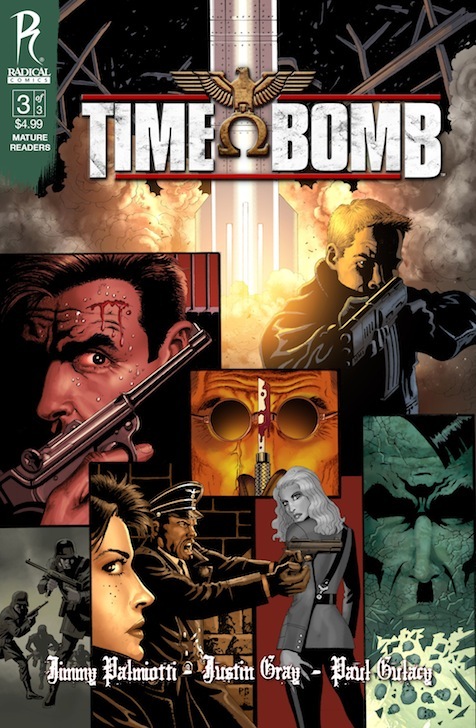 Palmiotti and Gray have given us an entertaining story about four Americans sent back in time to put a stop to a German contingency plan that almost wiped out the entire world. In this issue, our heroes penetrate the secret city under Berlin where scientists have been constructing the missile, and raise all kinds of hell. There's plenty of mayhem, torture, and, because Paul Gulacy is handling the art, women in their underwear. As much as I have enjoyed this series, there are a few elements in this last issue that don't make a whole lot of sense. I don't like the deus ex machina capsule that Peggy pulls out (actually, I don't want to say where she pulled it from) and saves the day. Also there are more than a couple of time travel issues that pop up right at the end of the comic, making some of the story pretty hard to swallow (accepting, of course, that this is a time travel comic). Still, we get to see some people smack Hitler around, which never gets boring. In the end, this was another successful comic for Radical, and one that feels like it's been ready-made for a movie adaptation one day.